Need more information about booking Home 7301134 ? 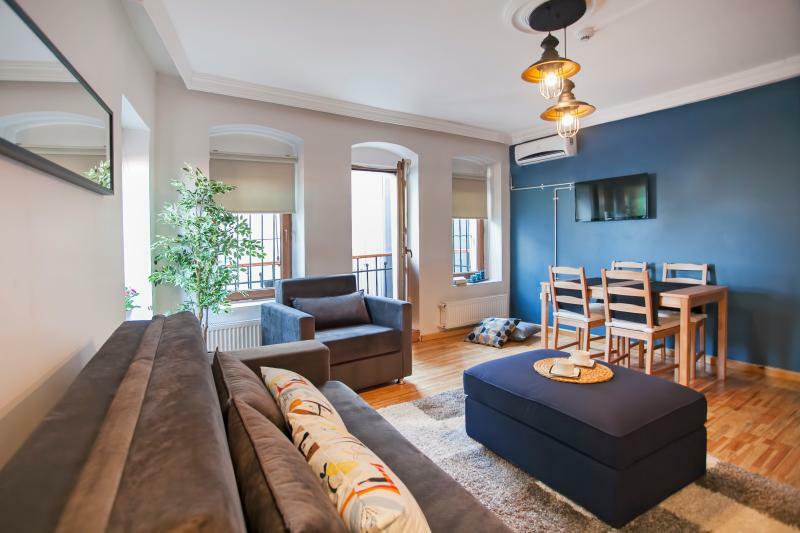 A 85 sqm, stylish and comfortable flat located in the heart of Galata, near Istiklal Street which offers easy access to all attractive directions. Suit has been renovated very recently by interior architects. Windows have a nice Bosphorus view. In our family suit, you will find everything needed for a comfortable stay. Two double beds, fresh clean linens for all guests, 24 Hour Hot Water, Central heating, Air conditioning, Satellite TV, Wi-Fi , Kettle and Fridge and Hair dryer. Our suit features an open-plan living room with full kitchen and a dining table. The Galata Tower is a mere 400 m away. Asmali Mescit, the main entertainment district, as well as Istiklal Street, are both within five minutes walking distance. The metro station is less than 3 minutes away and the tram, which is just one stop from the old town, is only 5 minutes walking distance. If you're looking for the perfectly located apartment, and a room with a view, or rather three rooms with a view, this is the place for you. Please respect to the neighbourhood and the peaceful silence of the street at all times. Can not make noise after 23:00. No partying. Unfortunately no pets allowed.